Want fries with your social media? That's a question Simon Fraser University researcher Steve DiPaola, co-creator of a new app, is asking with the launch of FaceFries. The application – launched this week by Apple as a free iTunes download – uses advanced image processing, psychological models of personality and emotion, and animation technology to "bring the human spark to social media" mobile applications. 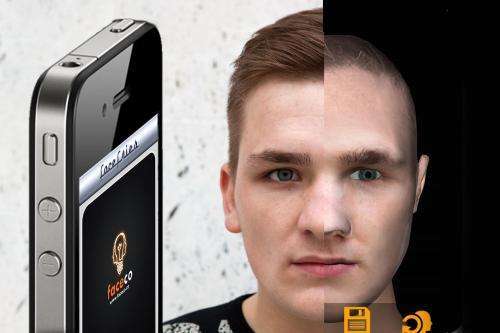 In a nutshell, FaceFries takes facial photographs and animates, merges or modifies them in ways that turns them into "realistic 3D animated avatars " for fun and creativity, says DiPaola, considered a world leader in facial animation technology. DiPaola and Liane Gabora, an associate psychology professor at UBC, were awarded startup funds through GRAND NCE (a Canadian National Center of Excellence) and formed a company last April. Since then, team of five researchers, programmers and designers has been collaborating to innovate within the social media field, says DiPaola. "Our mission is to give people a smile and foster creativity and laughter as they capture, create, collect and share faces," say the creators of FaceFries on their website, Faceco.co. "You can imagine, for example, siblings combining their faces to send a united 'Happy Birthday' message to a parent," says DiPaola, who has also blended photos to 'Obama-fy' himself and others. Other components allow voice-overs and aging to extend creative possibilities. The app uses photos stored on a mobile device, downloaded from the Internet or taken with a mobile device camera, which is directly accessible from the app. 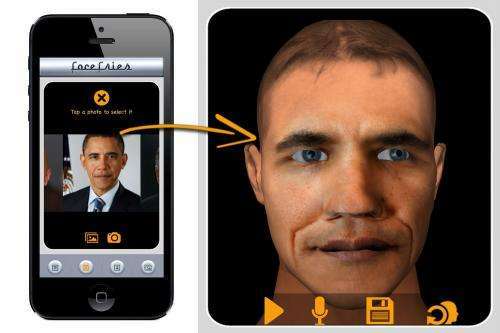 The users bring the "face fry" to life by speaking into the microphone of the mobile device. The "fry" repeats the message and moves its 3D face with emotional expression and gestures. Users can share their fries through social media. The researchers hope that users playing with images and representations of themselves will develop "a stronger sense of personal identity that encompasses not just who they are but who they could be," and a deeper sense of interconnectedness. "Your face is your outward representation for what is going on inside you and your eyes, the window to your soul," says DiPaola. "A facial expression represents in a deep way what is on the inside. This is a fun way to explore the 'essence of self'." An associate professor in SFU's School of Interactive Arts and Technology (SIAT), DiPaola is known for his facial recognition research and runs several projects through his iVizLab. He continues to advance his work on using new computer modeling techniques (including advanced eye-tracking methods) to show how artists, including Rembrandt and other Renaissance painters, used intentional vision-based techniques to guide the path of viewers' eyes through their paintings. The research has potential applications to help teach autistic children.